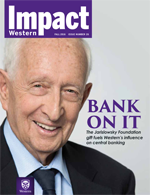 Impact Western is published three times a year to inform alumni, corporations, foundations, and other friends of Western about the University’s current fundraising initiatives and progress, and to highlight the impact of gifts in action. 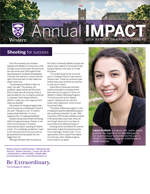 Published annually, Annual Impact provides stories, testimonials, and facts about how gifts made through Western Annual Giving have made an important difference for Western students. 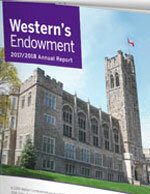 Western’s Endowment Report provides information on how Western's investment strategies to preserve the long-term capital value of its endowments in order to provide a meaningful level of support for generations to come. The report also includes a summary of the annual financial performance of Western's endowment funds with stories and facts about how these funds have touched the lives of Western students. 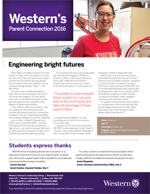 Western's Parent Connection is an annual newsletter for Parents that features articles about students who have received support through the Parents' Fund and informs parents about important dates and scheduled events. You can subscribe to the Parent Connection electronically by emailing annual.giving@uwo.ca.